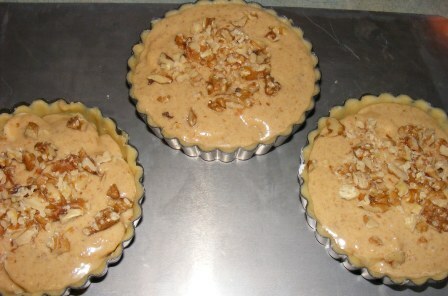 The third recipe I made from the Sweet Tarts and Pies section of The Modern Baker was another easy and delicious tart. I had sweet tart dough left over from when I made the bourbon-scented pecan tart the other night, so this tart came together really quickly. 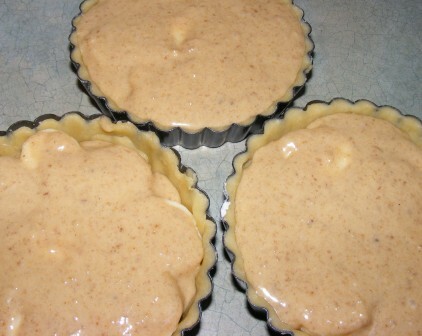 In fact, I mixed this recipe up this evening after work — something I rarely do — and it was less than 20 minutes from the time I got the dough out of the fridge until I was putting the tarts in the oven. I used my 4 1/2-inch tart pans and had enough dough for three tarts. I wasn’t sure how much filling to make, so I opted to halve the recipe. 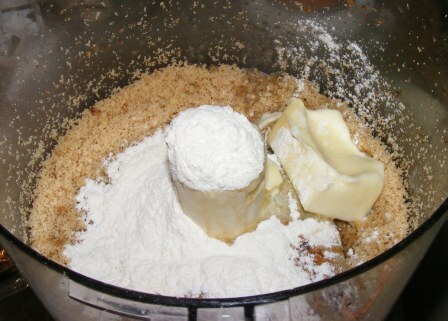 After rolling out the dough, I measured walnuts and brown sugar into the food processor and pulsed them until the nuts were finely chopped. 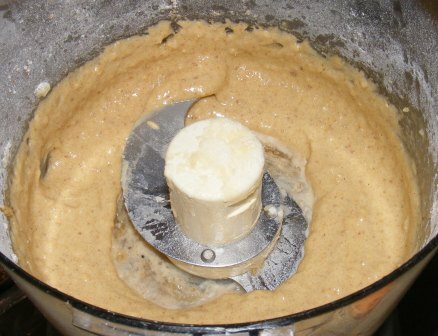 Then I added butter, an egg, cinnamon, vanilla extract, baking powder, and flour and mixed everything into a thin batter. 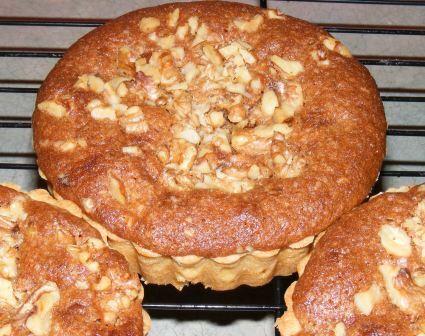 I cut up two bananas and arranged them in the tart pans, poured in the batter, then topped the tarts with chopped walnuts. I baked the tarts at 350°F for about 30 minutes. The recipe doesn’t give a baking time, so I started with 20 minutes and kept an eye on them until they were done. Other than the crust, the tarts looked almost like a cake. 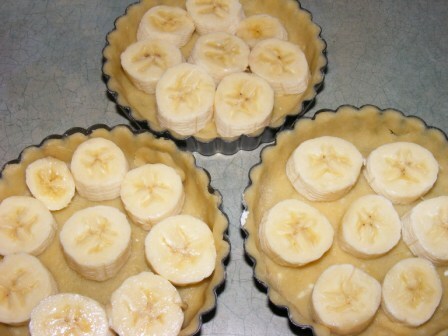 Now came the hardest part — waiting for the tarts to cool. I left them in the pans for about 15 minutes, then took them out and let them cool the rest of the way while I distracted myself by watching Jeopardy. I sliced into one of the tarts. The banana looked almost like a custard filling. I know some of my fellow Modern Bakers were a bit skeptical of this recipe, mostly because of the cooked bananas. 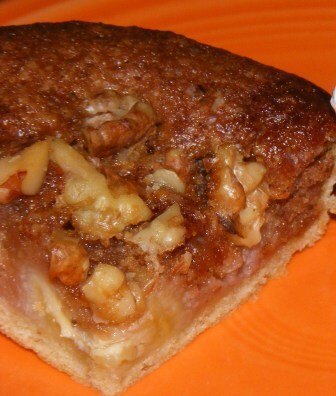 While I understand their reluctance, having tried this tart I can tell you it is delicious, bananas and all. Nick is right when he says the bananas cook to a sweet, jam-like consistency. 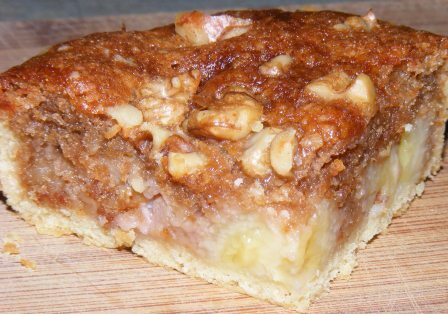 And the flavors of the bananas, walnuts, brown sugar, and rum all compliment each other, making this tart sweet, nutty, and hard to resist. 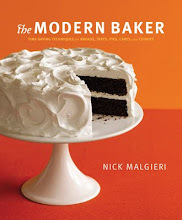 While I liked most of the savory tarts and pies in the last section, I think sweets are definitely Nick’s forte. And I’m looking forward to the rest of the recipes in this section. This one is definitely at the top of my to-do list…so glad it’s as yummy as it looks! Finally, someone else who’s looking forward to this recipe as much as I was! Can’t wait to hear what you think. The next time I make it, I’ll probably go a bit heavier on the rum. I didn’t measure it, just put my thumb over the top of the bottle and dribbled it on. Well, we like Bananas Foster a whole lot…a whole lot…and those bananas are cooked. Still thinking pecans rather than walnuts…wondering what a splash of rum would do to this. Just kidding. Maybe. I usually make every recipe as written the first time just to see the author’s intent, so will probably resist playing around with it. Yours look really good…just might make these after all. Am certain a little whipped cream garnish can rally the troops into acquiescence. The recipe calls for rum. I forgot to mention it in the post, but you drizzle some dark rum on them right after they come out of the oven. I ate a few pieces with whipped cream. It was really good that way. I’m definitely from the ‘skeptics camp’ on this one, although I’ll happily admit that your pictures look terrific. I’m sure it’s perfect – but with all the other sweet tarts and pies I want to try, this one slips to the bottom of the list. They really do almost look like a cake! This one is so easy to make. You could scale it down and make a mini with a scrap of dough left from when you make something else. I’m so glad you liked it. I know I won’t be doing this one. Bananas and I just have not gotten along since I got pregnant 4 years ago with my first daughter. I made some banana bread but I pureed the heck out of those bananas. I might come around in a few years, but this is a little too up-front banana for me. This looks seriously amazing! I would love to bake it. Thanks. It was really good. You should definitely try it.